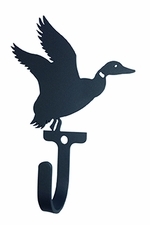 Approximate size: 3 1/4" W x 3 1/2" H x 1 1/4" D, Inside Hook Depth 1"
Our wall hook with a Duck taking flight silhouette is created of wrought iron and has a baked-on smooth black satin matte powder coating for maximum protection. *Basic mounting hardware is included. This American made wrought iron wall hook is handcrafted in Fabius, New York, by Village Wrought Iron.